Smashing & beating up is everyone’s favorite, right? There’s hardly anyone in the world who doesn’t love playing such type of games, even once in the whole life. 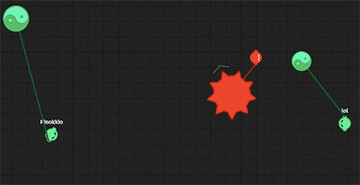 Zlapio brings back the sweet feeling of bashing in the world of IO games. Really, all you have to do is to smash your enemies – nothing else! Zlapio features a very fun gameplay. You play as a ball (emoji-like) holding a giant mace in your hand. The rope is elastic and allows the mace to act like a heavy yo-yo. This adds the fun part of the game. Since when you spawn, you have the mace with yourself. Your body is small, but your mace is HUGE. Your target is to deal with the mace to damage your opponent. The game’s graphics are simple and not so fluid, yet its pretty fun to play. The skins are quite interesting. There’re several skins available, but I love the “green jelly” skin most. The controls for Zlap io follows the simple movement, just like the other IO games. The mace will follow your cursor point. Use it carefully, as it’s very unstable to control. Your only goal is to hit your enemies with your mace. For more collision, the map for Zlap io is also kept small. Use your cursor to swing the mace around yourself. The mace is interesting. Whenever you hit an enemy and eliminate him, it will grow up in size and earn you point. When other players try to hit you, the mace can be used as a shield as well. The game follows the simple physics rule with the mace. It’s all about practice and practice to master the mace’s movement. However, the unpredictability and uncontrolled nature still leave room for the luck factor. This increases the adrenaline rush, don’t you agree?